Moving a piano can be a tough challenge. Pianos are notoriously heavy and large, that’s why the best option when moving your piano to a new home is to hire professional piano movers in Massachusetts. Wondering whether to move your piano by yourself? First, let’s think about the weight of the piano. Smaller ones weight around 300 to 400 lbs, but big ones run from 500 lbs to 800 lbs. What about grand pianos? Their weight can go anywhere up to 1200 lbs. You can guess how dangerous it is to try moving a piano by yourself, not only for it but for you too. Do the smart move and call professional movers today on 617-284-6040. 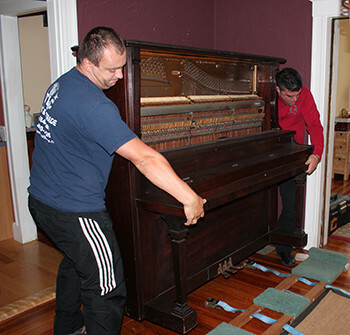 Boston’s TLC movers have extensive experience in moving pianos. We guarantee that your piano will be moved in the safest and most effective way. To keep it damage-free, our movers carefully pack the piano with safety blankets. This provides a cushion to keep surfaces just as they were before you had your piano moved. The design of most buildings requires the piano to be lifted using a crane. It might be a necessary step to protect your piano, and sometimes it is the only option. Fortunately, our movers are very experienced with all kinds of scenarios when it comes to moving a heavy piano. Our movers have moved any size piano you can image – from smallest to biggest. 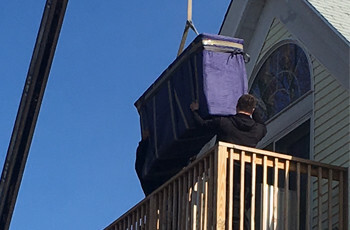 When a piano is too big to go through the staircase, our movers are prepared to move it out from a large window or terrace. It is the safest and quick way for our piano movers to transport it. Wondering about the piano moving cost? Every move is different – that’s why we need a bit more information to give you a relevant estimate regarding your piano moving cost in Boston, Massachusetts. To get a free price estimate please fill in our quote.